Americans’ love affair with the Bard of Avon dates back at least to the mid 1800s when Shakespeare’s plays were an essential part of the repertoire for traveling companies and visiting British Shakespeareans were lionized. In modern times, summer wouldn’t be summer without celebrating the genius of sweet William. The San Francisco Bay Area alone features several admired summer Shakespeare companies, including Marin Shakespeare. Summer Shakespeare is a complex cultural experience, something more than a typical evening in the theatre. Outdoors, often accompanied by a picnic, packed with family tradition and summer memories, its standards are not necessarily those of Broadway or regional companies. If the air is warm, the picnic delicious, the children content and the stars starry, that is enough to make the outing worthwhile. If the quality of the theatrical production is more than adequate, that is an added bonus. Jake Murphy and Louisa Frasconi as Romeo & Juliet. Photo Credit: Eric Chazankin. Marin Shakespeare Company’s current staging of “Romeo and Juliet”, is a mixed affair. I will confess, at the start, that Romeo and Juliet is not one of my favorite Shakespearean plays. Although it has some of Shakespeare’s loveliest poetry, there is a certain predictability to some of the most famous details, such as the nurse’s bawdiness or Romeo’s fickle taste in women. From my perspective, for this play to work well, it requires a freshness of approach that is all too rare. Marin Shakespeare’s version is adequate but stale. Lovers of the play will take pleasure in the retelling of the familiar story, but, for the most part, may not be deeply moved. Newcomers to Shakespeare may find it overlong at nearly three hours. In spite of flaws, there are elements to admire, most especially Jackson Currier as Mercutio, whose physicality is very unusual and very impressive. Simultaneously clumsy and graceful, drunken and wise, sloppy and elegant, Currier’s delight in the character and the stage is an absolute joy to watch. He has been performing with Marin Shakespeare Festival since he was a child. He has the rare quality that suggests he was born for the stage, and should have a sterling professional future. 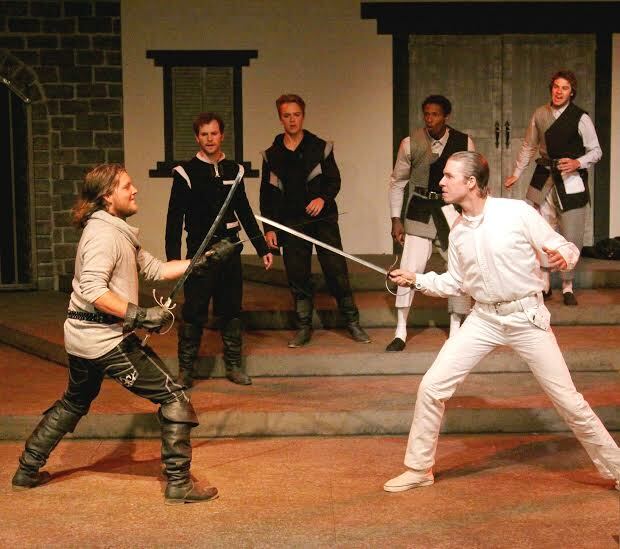 (from l to r) Mercutio (Jackson Currier) challenges Tybalt (Teddy Spencer). Photo Credit: Eric Chazankin. Jake Murphy makes his Marin Shakespeare debut as Romeo. He moves with the grace of a dancer, and speaks verse exceptionally well, in a beautifully supple, wide ranging voice. Fight direction by Richard Pallaziol is much more exciting than the usual fare, and well executed. “Romeo and Juliet”, by William Shakespeare, produced by Marin Shakespeare Company. Director: Lesley Schisgall Currier. Lighting: Maxx Kurzunski. Set: Joel Eis. Costumes: Abra Berman. Fight Director: Richard Pallaziot. Lord Capulet: Robert Currier. Lady Capulet: Marcia PIzzo. Juliet: Luisa Frasconi. Tybalt: Teddy Spencer. Nurse: Debi Durst. Peter: Adam Roy. Gregory: Jai Sahai. Old Capulet: Steve Price. Tybalt’s page: Derek Apperson. Rosaline: Lucy Black. Party Guests: Rachel Newman, Emily Steck. Lord Montague: Steve Price. Lady Montague: Catherine Ostier Bearden. Romeo: Jake Murphy. Benvolio: Sam Mickel. Mercutio: Jackson Currier. Balthazar, Romeo’s page: Javier Pritchard. Abraham, a servant: Gray Schierholt. Benvolio’s page: Aaro Vanderbeek. Prince of Verona: Scott Coopwood. Paris: Skylar Collins. Paris’ page: Max Seijas. Friar Lawrence: Julian Lopez-Morillas. Friar John: Jai Sahai. An Apothecary: Jai Sahai. Watchmen: Derek Apperson, Gray Schierholt. Posted in Reviews.Tagged Charles Kruger, Jackson Currier, Jake Murphy, Lesley Schisgall, Luisa Frasconi, Marin Shakespeare Company, Romeo and Juliet, San Franciso theatre reviews, Shakespeare, theatrestorm.